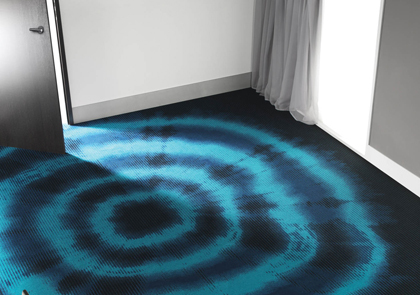 One small step for carpets, a giant leap for design! You can make your idea a reality in just one step. Balsan adapts to your creative process to meet your highest expectations. You can choose from across our different collections to customise your project as much as you like. In a world where flexibility is king, adapting to our clients’ needs is essential for us today. So we attach a very particular importance to bringing together design and quality in order to make your interiors into unique, comfort-filled spaces. Create your own using our personalisation module. Balsan offers customised solutions, depending on your project. For projects of 100m2 or more, you will find our Twilight and Sunlight colour palettes in our Color lights colour bank: one is imbued with the soft warmth of sunrise; the other with the dusky touch of evening. For projects of more than 400m², our duo concept means you can match, combine and design your personal concept from among the designs in the Duo, Duo2, Duo3 and Duo4 brochures. You can also take a look at our special designs in our Territoires collection. And if your project is of 800m² or more, use the Color Spirit colour bank: step into a world without limits, with an infinite colour palette offering boundless creativity for your designs.